Mariano Rumor wasted no time. The day after the bombings of 12 December 1969, the prime minister called a meeting of the secretaries of the Christian Democrats, the Socialist Party, the Unified Socialist Party (the name used by the social democrats after the socialist split on 2 July 1969) and Republican Party. His aim was to rebuild a four-party coalition cabinet. It was to take them over three months to come up with a new government line-up. The overall impression was that although the socio-political situation might be dramatic, in the palaces of Rome they were still using the same old alchemy in the allocation of ministerial portfolios likely to assuage the various political camps. Mauro Ferri and Mario Tanassi, the two leaders of the new social democratic party, were behind a strong government that — riding the wave of emotion triggered by the bombs — sought to impose an authoritarian stamp on the country. They spoke for that “American party” (as it was known) which vehemently opposed Italy’s progressive drift leftwards. Rumor’s real intention was to establish a centre government of Christian Democrats and the Unified Socialist Party that would crown, at policy level, the strategy that had led to the Piazza Fontana carnage. But the enormous turnout of trade unionists and left-wingers at the funerals in Milan forced him to think again. That slogan had immediately taken off. Soon it was being chanted with growing insistence on marches. And in fact 1969 recorded 300,000 hours lost to strikes as compared with the 116,000 average for the 1960s. Labour costs were on the rise, from 15.8 per cent (or 19.8 per cent in industry), increasing the wages component of the gross national product from 56.7 up to 59 per cent. A discernible shift in earnings was under way. A threat to the privileged classes of society and to those who only a few short years before had been the beneficiaries of the “economic miracle”. A seemingly pre-revolutionary situation existed in the country. Even though the revolution for which most students and a segment of the workers yearned for was not merely a distant prospect, but a practical impossibility, but what did that matter? Many honestly believed it was just around the corner, and many more were afraid that that was the case. Even though the advocates of the radical transformation of society were a tiny minority compared with the total population, the nation’s political axis was shifting to the left. Although harshly criticised by the extremist fringe, the Communist Party was preparing to expand into new areas. 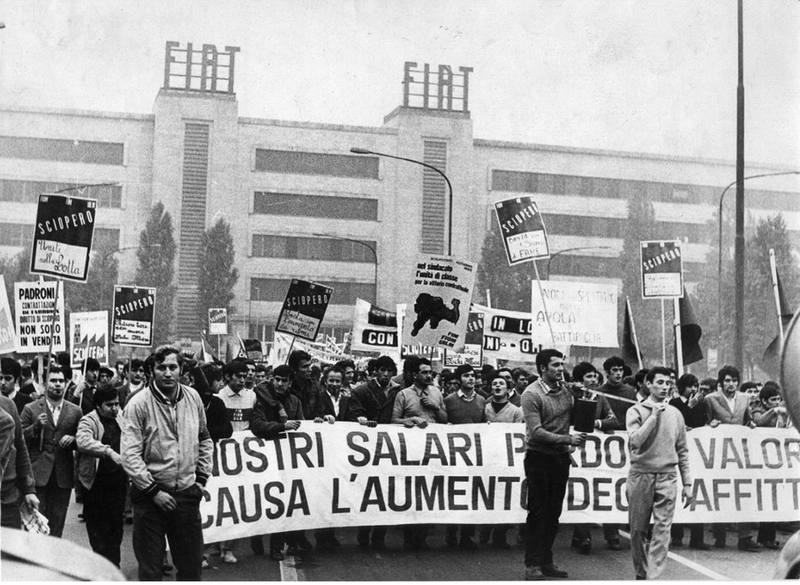 Caught on the hop by the student demonstrations at the start of 1968, the Communist Party leaders from the Via Botteghe Oscure quickly deployed to make up the lost ground, especially in the field of institutional politics — parliament. So much so that on 28 April 1969 the debate began on disarming the Italian police in an attempt to turn them into British “bobbies”. 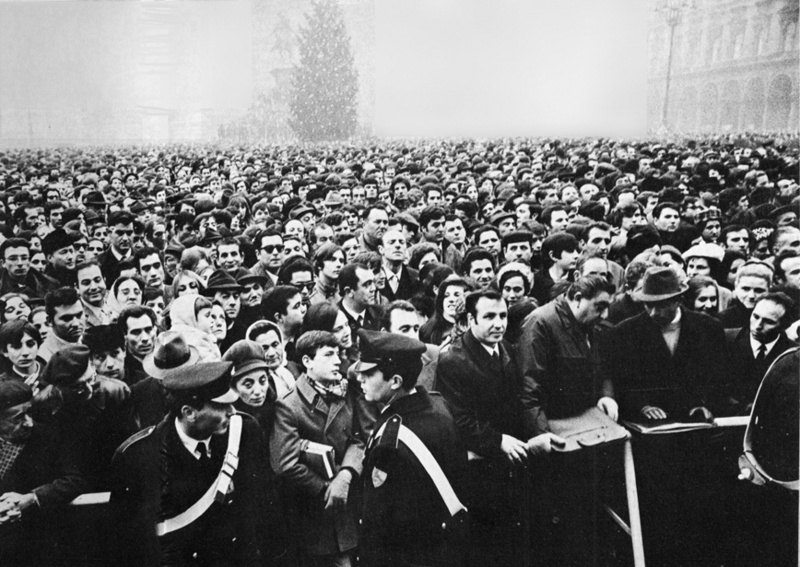 It only took the bombs in Milan on 25 April to consign that scheme to utopia. The strategy of tension was under way. This phase involved a revamping and synthesis of what had already been devised in theory and put into practice since the mid-1960s by leaders of the far-right and important elements in the armed forces. Italian Nazis and fascists were eager to eradicate the “communist contagion” and in this they were aided, abetted, monitored and, ultimately, directed by the Italian and American secret services. The CIA had been operating in Italy since the end of World War Two. In 1947 it had funded — through the AFL-CIO — the breakaway socialist party led by Giuseppe Saragat and helped by anti-Stalinist revolutionaries, the Iniziativa Socialista, led by Mario Zagari. Apart from the ideological motives that drove Saragat and Zagari, the CIA’s dollars successfully undermined the Popular Front and facilitated the victory of the Christian Democrats on 18 April 1948 when they took 48.5 per cent of the votes and won an absolute majority in the Chamber of Deputies. That victory had almost been written off. On 20 March 1948, George Marshall, the US Secretary of State, had warned Italians that in the event of a communist victory all US aid to Italy would dry up. In 1969 the CIA found its activities facilitated — the Italian president, Saragat, was a man who owed them a favour. The CIA had one great foe — communism, just as the KGB used every method available to it to combat the West. But whereas in the Third World the two agencies fought on almost equal terms — with the KGB having the edge — in the west the CIA brooked no interference. 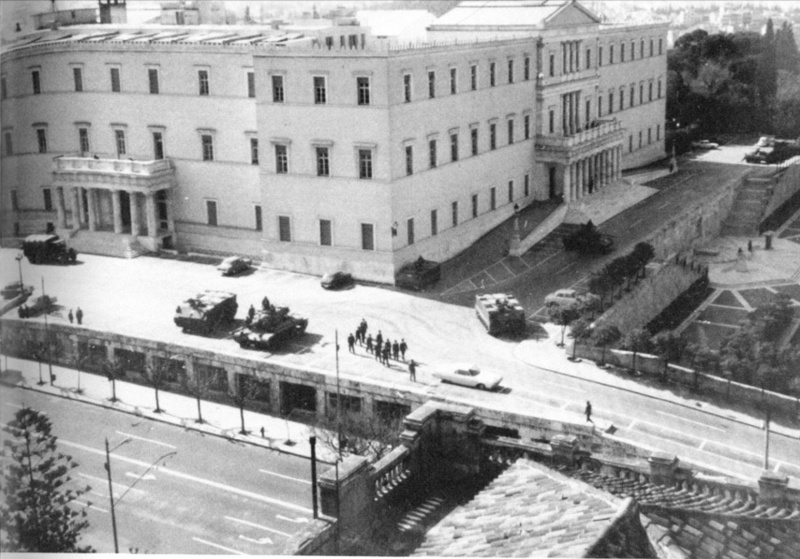 So much so that in 1967 it came up with a brilliant resolution to the Greek crisis by installing its own man, George Papadopoulos in power by means of a coup d’état. From this point on the “coup-makers” held the upper hand in the Agency in Europe — and would continue to do so right up until the mid-1970s. After Greece it was Italy’s turn and within the US-dependent SID the coup-maker faction was in the ascendant. From 1966 — the year he took office — Admiral Eugenio Henke led the SID and D Bureau was headed by Federico Gasca Queirazza, one of those who had been briefed in 1966 by agent Guido Giannettini on what the Venetian Nazis Franco Freda, Giovanni Ventura and Delfo Zorzi were planning. Gasca Queirazza passed this information on to his superior, Henke, who in turn forwarded the information to Interior Minister Franco Restivo. Did Restivo pass on this information to his party colleague and prime minister, Mariano Rumor? No? That takes some swallowing, if only because the repeated unbelievable attacks of amnesia suffered by Rumor during the first trial in Catanzaro provoked such hilarity, in spite of the dramatic setting. 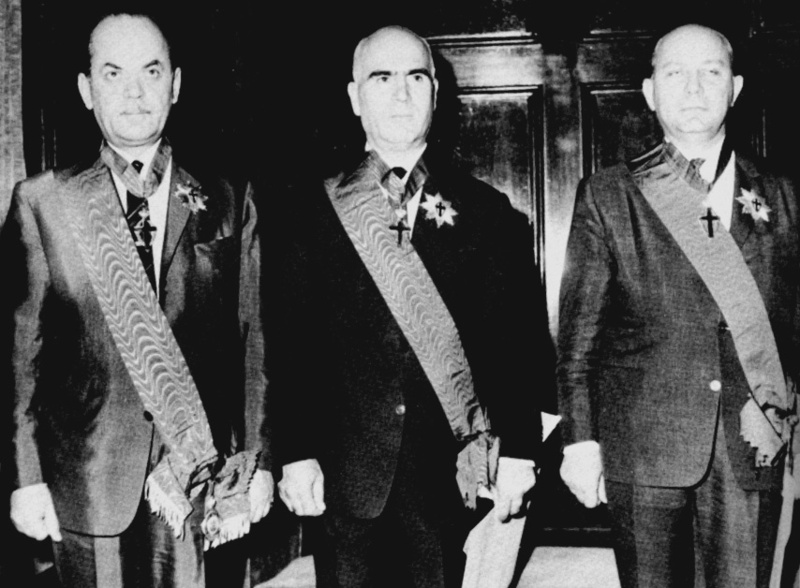 When Vito Miceli took over from Henke in 1970, the coup-maker faction was no longer simply diligently coordinating the attacks mounted by the far-right, it had taken the initiative as a direct organiser and Junio Valerio ’s coup attempt was part and parcel of this new dynamic. Miceli was also to stand trial for this later, but, as ever, nothing came of it. When they struck on the night of 7 December 1970’s men were not nostalgic old codgers. They had substantial cover and assistance. Miceli briefed Defence Minister Tanassi on what was happening, as did the chief of staff, Enzo Marchesi. In fact, Restivo knew everything even before the plotters held part of his ministry for a few hours. But when questioned in parliament on 18 March 1971, after the news had broken, Restivo denied everything. Naturally. The history of the coup in Italy remains unfinished business, as is the case of Piazza Fontana. History repeated itself in April 1973 with the Rosa dei Venti conspiracy, which involved even greater heavyweights who were much better prepared than Borghese had been — officers such as Colonel Amos Spiazzi (who had been around the block earlier, on 7 December 1970). The man who oversaw this proliferation of attacks and coup preparations was a leading engineer by the name of Hung Fendwich whose office was based in Rome’s Via Tiburtina. But it was not located in the sort of secret lair that one might imagine; it was in the offices of the Selenia Company, part of the STET-IRI group, for which he worked. Fendwich was the typical eminence grise who studied and refined plans, drew up analyses of the socioeconomic and political situation, but left the operational work — the “dirty work” — to men of more modest rank, men such as Captain David Carrett attached to the FTASE base (NATO command in Verona from 1969 to 1974), or his successor (up until 1978), Captain Theodore Richard based in Vicenza. Sergio Minetto, one of the CIA’s top Italian informants, led these men. Minetto was the man to whom Carlo Digilio, their plant inside the Ordine Nuovo group in Venice, would have been reporting. As an operator it was he who prepared the explosives and trained Delfo Zorzi and Giovanni Ventura in the group’s powder magazine — an isolated house in the Paese district near Treviso. The bomb attacks that erupted in Italy between 1969 and the mid-1970s (although they continued after that date) were regarded as overtures to a coup d’état. Indeed, although the coup never happened, it was always in the air and indeed had a precise function. It sent out a clear and menacing message to the opposition — i.e. the Communist Party. But it was no coincidence that following the coup in Chile in September 1973 — which brought the number of military regimes around the globe to 47 — PCI secretary Enrico Berlinguer floated the idea (from the columns of the review Rinascita) of an “historic compromise” — i.e. for a government agreement between the Christian Democrats, the Italian Communist Party and the Italian Socialist Party. But it was to take another 23 years before the Democratic Left Party, the PCI’s heir, entered the government as part of a centre-left coalition. The bombings crystallised the institutional political situation and in response the left presented the prospect of armed struggle. 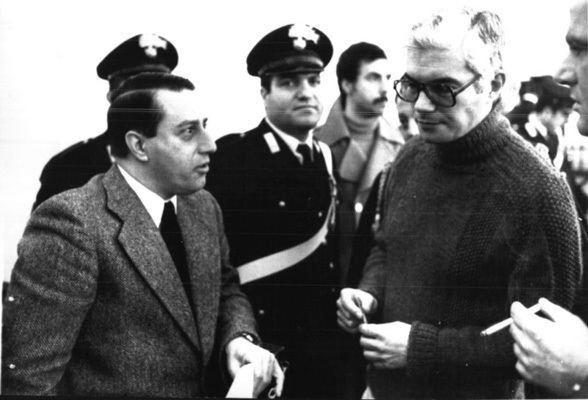 The ongoing outrages and the threat of a coup, among other things, drove many extra-parliamentary militants underground, including people such as the publisher Giangiacomo Feltrinelli. All this gave rise to a vicious circle, which, to some extent, served as an a posteriori excuse for the theory of “opposing extremisms’. The only hope was to trust whoever was in power at the time — that is, the men who were rubber-stamping and providing the cover for what the Interior Ministry’s Bureau of Confidential Affairs and the SID were doing under instruction from the CIA. From the ministers came the directives and the secret services carried them out — and added more than a little initiative in the process. It was no coincidence in 1974, when SID officers brought Defence Minister Giulio Andreotti (in the fifth Rumor government) the recordings made by Captain Antonio Labruna with industrialist Remo Orlandini, a man who had been caught up in the coup attempt. Andreotti’s advice was that they “do a bit of pruning”. Translation? Purge the tapes of the most important names, which is to say the names of high-ranking military personnel implicated in the failed coup attempt. The practice of saying nothing or telling lies continued through the years. On 13 October 1985 the weekly Panorama published extracts from a document by Bettino Craxi, the prime minister, inviting the men of the secret services “to abide by a policy of noncooperation” with the magistrates questioning him. Craxi never denied the veracity of that report. How could he? But he did bring pressures to bear on the judges to ignore it. So the politicians knew all about the secret service plots — and were often the prime movers behind it. They knew that the fascists were being used to further the strategy of tension and they were either jointly responsible for this or direct promoters of it, like Restivo. So there was raison d’état behind the 12 December 1969 bombs — a matter of opting for terrorism as a means of holding on to power. “12 December 1969 signalled a watershed in the history of the republic, in the history of the left, in the history of movements […] because in effect on that date, along with 16 ordinary individuals there perished a significant portion of the first republic — a substantial portion of the machinery of state consciously plumped for illegality. It set itself up as a criminal power while continuing to man essential institutions and was permitted to do so (the ‘State servants’, policemen, judges, secret agents, politicians, secretaries, ministers, pen-pushers and henchmen who cooperated in the implementation of this crime and its cover-up by the laying of false trails, obstruction and ensuring the crime remained unpunished are numbered in the thousands). Since then, Italy has ceased to represent a constitutional democracy in the fullest sense”, wrote the political scientist Marco Revelli in his book Le due destre. Such widespread collusion also raises doubts. How much did the main opposition party — the Italian Communist Party, now the Democratic Left Party — know about the Piazza Fontana massacre? A lot, to be sure. But how much? And to what extent did the fear of bombs and coup d’états taint the PCI’s positions? To what extent was it induced by such fear to propose its historic compromise and then embrace coexistence? The answer to that can be found only in the archives in the Via Botteghe Oscure, which are as impenetrable as the Vatican’s. But we can offer one answer, an answer which — given the guilt that lies at the highest levels — can only be that the massacre of Piazza Fontana was a State massacre. And the State was, moreover, the mother of all the massacres. THE FACT THAT from the mid-1960 onwards fascists and Nazis stepped up their efforts to obtain arms and explosives was no casual matter. The strategy of tension theory was being elaborated— and elaborated openly. In Rome from 3 to 5 April 1965 leading exponents of the right gathered in the Parco dei Principi hotel for a symposium on “Revolutionary Warfare”, organised by the Alberto Pollio Institute of Military History. While Rauti and Giannettini’s contributions drew applause, it was the university lecturer and Orientalist, Pio Filippani Ronconi, a cryptographer with the Defence Ministry and the SID who electrified the audience. The papers read at the symposium were published later that year as La guerra rivoluzionaria by the Gioacchino Volpe publishing house. The book enjoyed what was essentially a “militant” readership among the various far right groups. For instance, Paolo Molin from took a copy to show to Ordine Nuovo activists in Venice, including the members of the cell run by Delfo Zorzi. The topic of the Parco dei Principe symposium was the appropriate short-term strategy to be adopted in the face of perceived communist advances and to keep Italy within the western orbit. In his paper “Hypothesis for a Revolution”, Filippani Ronconi suggested a security organisation structured on various levels — operational as well as hierarchical. The grassroots would be professionals — teachers and small industrialists — people capable of carrying out only wholly passive and non-risky activities, but the sort of people in a position to boycott communist promoted initiatives. The next level consisted of people capable of “bringing pressure to bear” through lawful demonstrations: these were people who would rally to the defence of the State and of the laws. Texts on the threat of communism were nothing new, but here was something that was qualitatively new — and it was not just a theoretical essay. The organisation outlined by Filippani Ronconi was already being set up and would shortly become operational. The authors and distributors of this leaflet were Franco Freda and Giovanni Ventura, two of the main protagonists of the outrages. Another individual of some note in this tale appeared on the scene at this time: Guido Lorenzon who was an officer on the establishment of the base in Aviano at the time and who was among those who received the leaflet. He mentioned it to his friend Ventura and — surprise, surprise — Ventura admitted that he was one of the authors of the document. He would eventually be convicted with Freda in 1987 of incitement to crime. Along with the Freda and Ventura, someone else was working to set up the Nuclei di Difesa dello Stato network — which shadowed the better known, but more dangerous ‘stay-behind’ secret army organisation, Gladio. After a refresher course with the Third Army Corps in Milan in the autumn and winter of 1966-1967, Major (now colonel) Amos Spiazzi, in charge of the army’s I (Intelligence) Bureau in Verona was tasked by his superiors “individually and by word of mouth” to shadow Gladio’s structure in his home city. As Spiazza told Guido Salvini on 2 June 1994: “I was also informed that, on a region by region basis and province by province, personnel with similar characteristics needed to be recruited, in units as water-tight as possible and trained in three man teams […] using the services of instructors from the local units […] These Nuclei adopted the designation of Legions […]. In this way I set up the Fifth Legion with 50 hand-picked people “. Spiazzi’s involvement was not limited to training: he organised conferences and debates, contributed to the journal of General Francesco Nardella‘s Movimento di Opinione Publica (Nardello was a member of Licio Gelli’s P2) and was in touch with Adamo Degli Occhi, a Milan lawyer who led the demonstrations of the alleged Maggioranza Silenziosa (Silent Majority), and with Junio Valerio Borghese’s National Front (Borghese had been commander of the Decima MAS and had defected to the Salò Republic in 1943). From the Veneto region to Lombardy, and, more precisely, to the Valtellina, Carlo Fumagalli was a mythic figure as far as his men were concerned. As a commander during the resistance, he had headed a non-aligned unit, I Gufi, made up of “white” partisans. His group had worked closely with the American wartime clandestine service, the Office of Strategic Services (OSS, later the CIA), for which he received the Bronze Star at the end of the war. Fumagelli maintained his links with the American intelligence services and at the end of the 1960s he was ready to help influence the Italian political system towards a presidential structure with an even more emphatically pro-NATO stance. Fumagalli had set up the Movimento di Azione Rivoluzionaria (MAR) and to provide cover for its illegal activities, he ran a garage, which specialised in off-the-road vehicles and associated activities. He wholeheartedly adopted the strategy of provocation through attacks intended to be blamed on the left, but the coup d’état for which he yearned had none of the pro-Nazi connotations of his “allies”. Not that this stopped him from mounting spectacular operations. A fire started in the Pirelli-Bicocca tarpaulin depot in the Viale Sarca took ten hours to burn out. The damage was estimated at a thousand million lire at the time. During the fire a 30-year-old worker, Gianfranco Carminati, lost his life. Years later Gaetano Orlando, the man regarded as the MAR’s ideologue admitted: “The MAR group’s plan was that the attack should be put down to the Red Brigades which were on the rise at the time”. “I remember the Pirelli attacks at the beginning of 1971 and can confirm that our organisation had nothing to do with big fire at the Pirelli-Bicocca tarpaulin depot” was the claim made on 23 July 1991 by Roberto Franceschini, the then leader of the Red Brigades in Milan, who has since severed all ties with terrorism. Exactly one month earlier, on 7 December 1970, a number of armed columns led by Prince Borghese from the Fronte Nazionale entered Rome. Among the main financial backers of the operation were Remo Orlandi, a Rome builder and Borghese’s right hand man, and Attilio Lercari, from Genoa, the administrator with Piaggio. 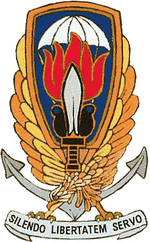 The objective was to seize the main political headquarters, the RAI TV station and the airport, while Stefano Delle Chiaie’s men (Avanguardia Nazionale [AN] — personnel) were to seize control of the operations centre at the Interior Ministry. The ministry would be handed over to the carabinieri while the AN people rounded up political opponents for internment on the Aeolian Islands. Ships provided by Genoa shipping magnate Cameli were on stand-by to transport them. It was a classic coup d’état. But something went awry, or somebody backed out. After a frantic round of phone calls the would-be coup-makers pulled out of Rome. Roberto Palotto and Saverio Ghiacci who, with other Avanguardia Nazionale militants, had succeeded in getting inside the Interior Ministry (with the help of Salvatore Drago, the duty physician at the ministry and P2 member), had to evacuate the building at speed. But the coup attempt was not confined to the capital. “In Venice too […] on the night of 7 December, arrangements had been made for people to muster at specific points. Muster they did, but shortly after that the stand-down orders arrived, much to the disappointment of all those present […] The rendezvous point was the Naval Dockyard — that is the area outside the Naval Command. In connection with these initiatives I reported regularly to Verona (to the FTASE — NATO Intelligence Service), which I then briefed on various developments” explained Carlo Digilio, who was linked with the Venice Ordine Nuovo group and had been a CIA asset since 1967. The agent to whom Digilio reported was Sergio Minetto, head of the CIA network in the Triveneto area. Minetto, of course, denied his part in the affair. The FTASE to which Digilio alludes was the general command of the Atlantic Alliance in Southern Europe. Other evidence, again collected by Judge Salvini, revealed that in many places around Italy, servicemen, civilians and carabinieri were on stand-by to act in support of the coup d’état in Rome. The man who called a halt to the operation was in fact its mastermind, Licio Gelli who was also to have supervised the kidnapping of Giuseppe Saragat, Italy’s president. Gelli was later to exploit the involvement in the coup of a number of high-ranking officers for his own blackmail purposes and long-term intrigues. But the verdicts handed down in November 1978, November 1984 and finally by the Court of Cassation in March 1986 cleared the conspirators of all charges. As for Gelli and the conspiratorial activity of the members of lodge P2 over many years, a definitive ruling from the Court of Cassation on 21 November 1996 found that Gelli should be sentenced to — but not serve— 8 years, solely for the offence of procuring sensitive intelligence, thereby closing the case begun in 1981, when the Guardia di Finanza discovered a list of 962 names of P2 lodge members in Gelli’s home, the Villa Wanda, in Castiglion Fibocchi. That investigation had been taken from Milan magistrates Gherardo Colombo and Giuliano Turone and transferred to Rome. The prosecutors in the capital had done their duty and stymied the investigation.